Hans Ulrich Obrist curated his first exhibit in his kitchen when he was twenty-three years old. Since then he has staged more than 250 shows internationally, many of them among the most influential exhibits of our age. Ways of Curating is a compendium of the insights Obrist has gained from his years of extraordinary work in the art world. It skips between centuries and continents, flitting from meetings with the artists who have inspired him (including Gerhard Richter, Louise Bourgeois, and Gilbert and George) to biographies of influential figures such as Diaghilev and Walter Hopps. It describes some of the greatest exhibitions in history, as well as some of the greatest exhibitions never realized. It traces the evolution of collections from Athanasius Kircher's seventeenth-century Wunderkammer to modern museums, and points the way for projects yet to come. Obrist has rescued the word "curate" from wine stores and playlists to remind us of the power inherent in looking at art--and at the world--in a new way. 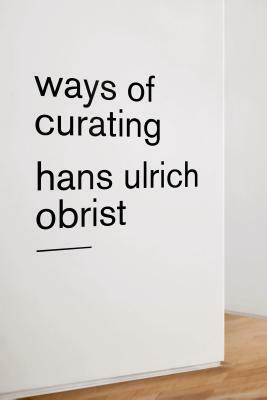 Hans Ulrich Obrist is a Swiss-born curator and writer. He is the co-director of exhibitions and programs and the co-director of international projects at the Serpentine Galleries, London. His previous books include A Brief History of Curating; A Brief History of New Music; Everything You Always Wanted to Ask About Curating But Were Afraid to Ask; Sharp Tongues, Loose Lips, Open Eyes, Ears to the Ground; Ai Weiwei Speaks, and nearly thirty volumes of his Conversation Series of interviews with contemporary artists.